I have often wondered why people take real life events, with all the drama they afford, and turn the events into fiction. "Titanic" with Leonardo DiCaprio springs to mind. So I was a bit taken aback when I read a review of the new E.L. Doctorow novel "Homer and Langley." He sets the story in the 1950's several years after the brothers died. He even has them dying at seperate times! This is a book I will probably not read- but let me tell you the real story, as I remember it being told by my Uncle Irving when I was about 8 years old. I had been going in and out of the deserted houses that were coming down all over my neighborhood to make way for new apartment buildings. My Uncle found out and told me of the structural dangers and possible pit falls attendant to playing in such places. 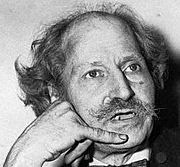 This is the story he told me- Once there were two brothers,Langley and Homer Collyer, who lived at 128th Street and 5th Avenue in an old brownstone. 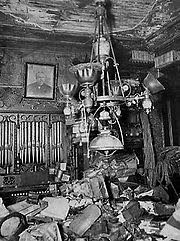 They were hoarders. That is, they kept everything and anything. Born to a Gynecologist, Herman Collyer and their mother Susie Frost, they were said to have roots extending back to Plymouth Rock and the Mayflower. The parents were both dead by 1929 and Homer and Langley were left to their own devices. They both had Columbia University degrees. One was in Admirality Law and the other in Engineering. They continued living in the family home even as the demographics of the neighborhood changed around them. 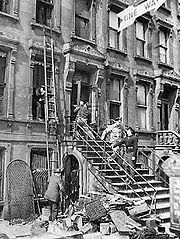 Acting on rumours of great wealth hidden in the old brownstone, several attempts were made to break in during the 1930's. This resulted in one brother booby trapping the entire house. The brothers lived as virtual recluses for years. In 1939 they lost their electric and water due to non payment of utility bills. Langley fetched his water from a park 4 blocks away at night! Homer, blind and crippled by 1933 was under the care of Langley for the rest of his life.Neither brother worked but when the City tried to foreclose on the property for tax reasons in 1939 Langley wrote a check and paid the amount in full. Around 1943 the press found the story too compelling to ignore and went in to the house to investigate. They found piles of newspapers floor to ceiling. Langley claimed that he was saving them for Homer when he regained his sight. Langley had actually started his brother on a diet of 100 oranges per week in a hope that the massive amounts of Vitiman C would do the trick. Someone passing by the house in March of 1947 smelled a foul order and called in a tip to Police. It took 7 men to get in the house and past all the rubbish. They found Homer, newly dead and not the cause of the smell. Dependent upon Langley for food he had died blind and alone about 10 hours earlier of starvation. Langley would be found weeks later,the body trapped beneath one of his own booby traps. Most of the junk in the house was worthless bric a brac and newspapers, boxes and string. There was also a large cache of guns and ammuntion. So this is a perfect example of why I read Non-Fiction. You can't make up stuff as good as this.